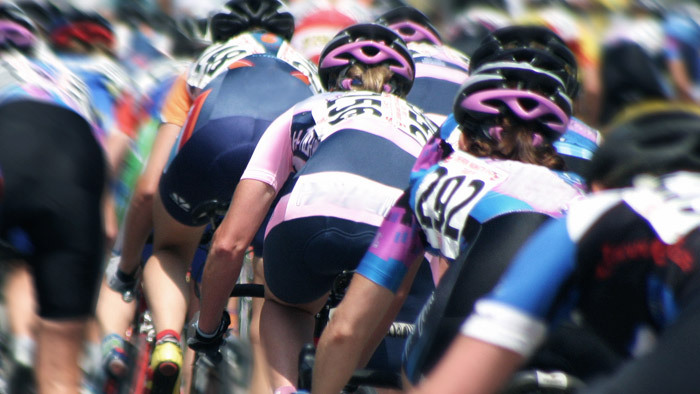 Criteriums are a discipline that dominates the American racing schedule. These events race around downtown city streets and are very fast and intense, requiring both speed and skill. To replicate the demands of the race, training for these events requires a rider to complete short, very difficult intervals. In doing so, a rider will ensure optimal performance on race day. Though excessive volume in training isn’t necessary, a proper taper into an A-priority criterium is still required to rest from the intensity-based workouts. Here, we’ll briefly discuss the training for criterium success, then outline the reasons for tapering and discuss how and when to implement this to make the most out of your season’s peak. The training for a criterium involves many short, intense intervals with few ‘endurance’ rides. These long rides are very non-specific to the demands of the racing style, therefore the need for them is minimal (only needed to maintain a high level of fitness). These race-specific efforts will fall into any zone that is supra-threshold to mimic race-like exertions and must have slight rest between. Primarily, a rider should concentrate their training efforts on increasing their anaerobic capacity, which allows them to ride above their Functional Threshold Power (FTP) more frequently, and for longer durations, without a large accumulation of fatigue1. Going into an A priority event, a rider will need to sufficiently rest (read: taper) to perform optimally and maximize the gains from the hard work they’ve accomplished. Without this taper, a rider will enter race day tired and will not reap all of the benefits of the intervals they have previously completed. While the physiological implications of tapering are well documented, this taper will have a dual effect. A proper taper also allows the rider to rest mentally in order to go into race day ‘hungry’ to hurt and to earn a result. By tapering effectively, the rider will come into an event both hungry for a placing and fresh enough to earn it. In the 1 to 2 weeks leading up to an A-priority criterium, a rider must be cognizant of their actions off the bike as well. This includes a rider’s nutritional intake. If you want your body to perform like a sports car, you shouldn’t fuel it like a hatchback. Because glucose (sugar) is the primary fuel source at high intensities, a rider will want to ensure they are consuming adequate levels of carbohydrate (6-10 g/kg daily) leading into a peak event so their body is fueled properly for these levels2. Also, recovery and tapering doesn’t simply imply additional days off the bike. Proper rest includes limited activities (walking, exercise, strength training, etc.) and living by the statement, “Why stand when you can sit, why sit when you can lay down”. Though it may be minimal, the additional energy reserves will only help come race day. After all, if you want to race like a pro you have to treat yourself like a pro– both on and off the bike! The question a rider and coach must ask is how much to taper, i.e. cut from the training, to gain this freshness. In doing so, a rider inevitably must sacrifice a minimal amount of fitness to shed fatigue, thus gaining form. Contrary to popular belief, this reduction in fitness does not come at a cost of performance3. The classic mindset is to cut volume by approximately 50 percent over the course of two weeks leading up to the event while maintaining the same duration and level of intensity. The idea being the volume cuts will make a rider more ‘fresh’, while the intensity will maintain a rider’s ‘sharpness’. However, I suggest the use of the Performance Management Chart (PMC) to determine how much rest to offer a rider as it caters more precisely to a rider’s particular situation. To do this, I look at historical best races and determine a rider’s Chronic Training Load (CTL, Fitness), Acute Training Load (ATL, fatigue), and Training Stress Balance (TSB, Form) on those days. I then use the predictive functionality within the PMC in TrainingPeaks to determine what training needs to be completed to replicate those values again in the future. By prescribing a daily Training Stress Score (TSS), I can accurately determine what needs to be done in the 1 to 2 weeks leading up to a peak event to lead to an ideal combination of fitness and form. Criteriums are a very popular and spectator friendly event. Because of this, many riders elect to use these races for their season’s peaks. Because the nature of the training is so intense, proper recovery is vital to maximizing the gains to be had. This recovery is meant to allow for full physical regeneration from the training they have completed, while giving the rider’s mind an opportunity to rest and ‘recharge the batteries’. In doing so, a rider will put themselves in the best possible position come race day to have their best ever race!